Ever heard of dihydrogen monoxide (DHMO)? Sound familiar yet? DHMO, if you didn’t know, is the same thing as H2O, or water. More than anything, this is an exercise in how anything can sound scary if you slap a chemical name on it without some training in chemistry or biochemistry. This description has been making the rounds of the internet for at least the past six years, but I saw it again this past week on IFLS and it reminded me so much of this book. Patrick di Justo’s book explores the darker corners of ingredient labels on major foods and products. This book doesn’t have much of a narrative structure – it’s composed of a series of vignettes on different processed foods and products in the United States without any underlying tie between them. Each new section starts with a picture of a food or product and lists the main ingredients along with any interesting chemical or historical facts about each ingredient. The format was clean and well-organized, but it got a little repetitive after 200 pages. In science, there’s a difference between pretentiousness/sensationalism and precision of language. Sometimes we need highly specific jargon to make sure everyone is on the same page with what exactly we’re discussing, but when we don’t, we’re taught to simplify as much as possible. This book walked that line fairly well, but there was a disconnect in who the author’s intended audience is – there are some overly simple explanations of what solids and liquids are, and then some more complex sections filled with chemical names and explanations. The author doesn’t sensationalize each chemical name and usage, but sometimes I felt like the book was trying to elicit shock or fear or disgust from me. The author puts a disclaimer at the beginning of the book, claiming sensationalism is not his goal, but nonetheless the commentary for each section repeatedly mentioned how di Justo ‘ruined’ certain products for family and friends, and I couldn’t help but wonder why. Maybe it’s just my biology background talking, but I kept feeling like this book was trying too hard and falling flat on the shock factor. To be honest, not much here is revelatory if you’ve had a few basic chemistry and biochemistry courses, so the ‘shock’ came off as more annoying than anything else. That being said, I have to admire how much work Patrick di Justo put into this book – each product mentioned must have taken a long time to research, especially with certain companies clutching their proprietary and trade secrets close. The most interesting parts of the book were the backstories behind how these articles came to be. How the author almost ruined Christmas in the eggnog section of the book is an alternate reality storyline which I’d read another full book about, and I learned a few interesting historical facts about food (who knew Queen Victoria used marijuana to ease her menstrual cramps?) and how it’s regulated in the United States. Final Thoughts: Maybe it’s just my biology background talking, but I kept feeling like this book was trying too hard to get an ‘ick’ factor reaction from me. To be honest, not much here is revelatory if you’ve had a few basic chemistry and biochemistry courses, and it might be frustrating if you’ve had more training than that. Other than that, it was an enjoyable, light, nerdy afternoon read. 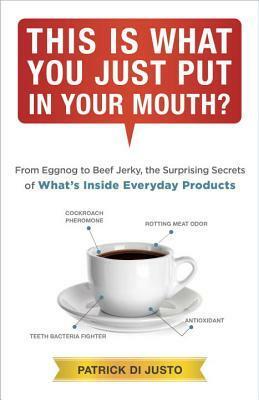 A FREE COPY OF “This is What You Just Put in Your Mouth?” WAS PROVIDED BY BLOGGING FOR BOOKS FOR A FAIR AND HONEST REVIEW. All I can say is that despite what you say you felt, I promise I was not trying to go for the “ick” factor. Also, the intended audience was literally _everybody_ — I don’t believe in writing a book just for a few people. (This “carving out a niche” thing is ridiculous.) As such, I felt it was prudent to cover as many bases as possible, thus the really simple explanations of certain things, side-by-side with the slightly more complicated explanations.